Family Weekend is a UCF annual tradition bringing together families and students to create memories that will last a lifetime. Join us for 2019 Family Weekend: September 27-29! I care deeply about lots of things at UCF. Number one being my status as a proud UCF Parent of a junior studying mechanical engineering. Another is athletics — I hold season tickets to Knights football and basketball, and I enjoying tailgating as a way to spend time with my family. So naturally, Family Weekend is one of my favorite times to visit campus along with my fellow UCF Parent & Family Philanthropy Council members. There’s nothing quite like the fun and electric atmosphere of this UCF tradition. I encourage you to experience it for yourself while building some new memories with your family. If you’re interested in becoming an active part of UCF year-round, we love welcoming new members to the council. 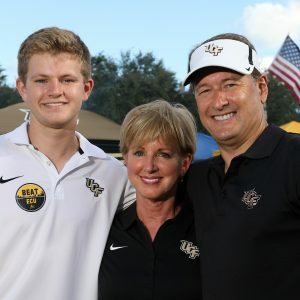 Please connect with our university contact, Annie O’Donnell, to learn more about our group and the work we do to enhance the student experience at UCF for all Knights.